A4 Size 7.3 x 10.45 in. A4 Mounted 7.3 x 10.45 in. (272 x 389 mm) 11.7 x 16.5 in. With his right hand he holds a golden five-pointed vajra in front of his heart, while his left hand rests upon his lap in the gesture of meditative equipoise as he supports a skull-cup filled with the nectar of immortal wisdom. Within this blue nectar stands a golden longevity vase that is crowned with a blazing wish-granting gem. 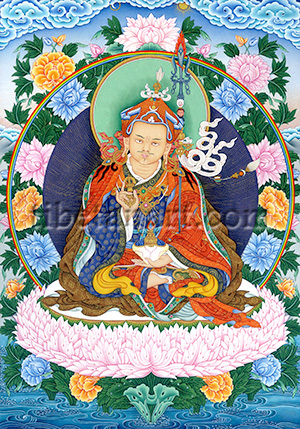 In the crook of his left arm Padmasambhava supports the black bamboo shaft of his tantric staff or khatvanga, which is adorned at its top with a crossed-vajra, a nectar-filled vase, three impaled heads, and an iron trident adorned with chained links and a blazing central prong. The three heads represent the ‘three kayas’ or 'divine-bodies' and consist of a freshly severed blue head (nirmanakaya), a moist red head (sambhogakaya), and a dry white skull (dharmakaya). A billowing white silk ribbon is tied around the base of the khatvanga's nectar-vase, along with a pearl thread that supports a small pellet-drum or damaru, a bell, the conjunct emblems of a red sun and white crescent moon, and a yak-tail pendant.